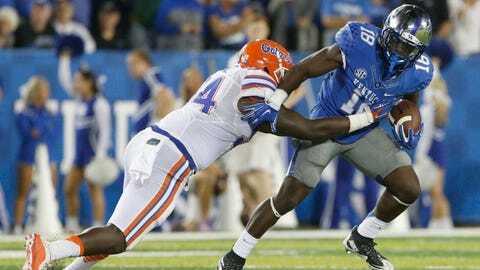 Can Williams help Kentucky improve its record to 5-1? Kentucky is hosting Auburn Thursday in what should be a very anticipated matchup for Big Blue Nation in search of its third SEC win. If the Wildcats are going to be bowling in 2015, they may need to win this home game. Adding an extra level of hype to the game, sophomore Stanley ‘Boom’ Williams will be making a return to the field, according to Kentucky head coach Mark Stoops. "He’s back in good standing," Stoops said Monday. The Wildcat coach was asked if Williams values his role with the team more after the suspension. "I believe so," Stoop said. "That’s part of us building our program and growing, and bringing along some young guys still. Just because we’ve talked about them for a year and a half doesn’t mean they’re grown yet." Williams is averaging over seven yards per carry this season after accounting for six touchdowns as a freshman for Kentucky.